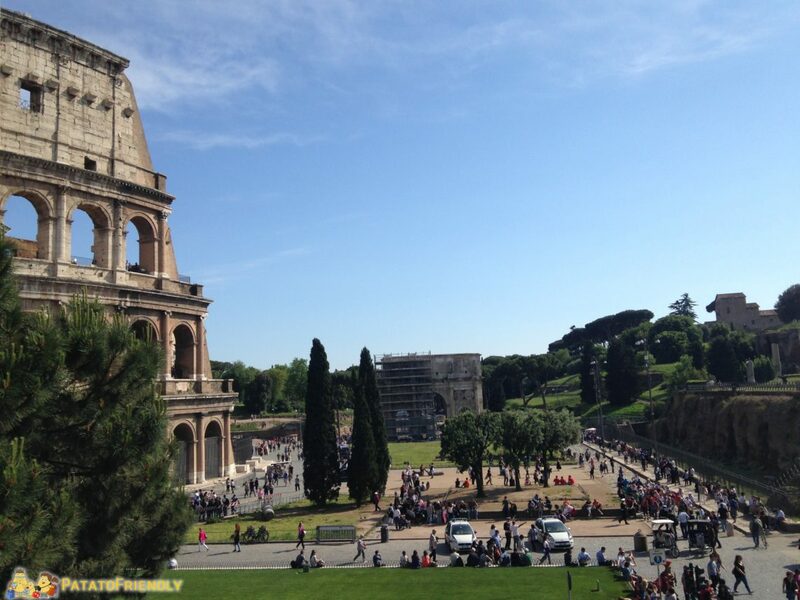 Rome is a wonderful city, that’s it and there are so many things to do in Rome an holiday it’s not enought. 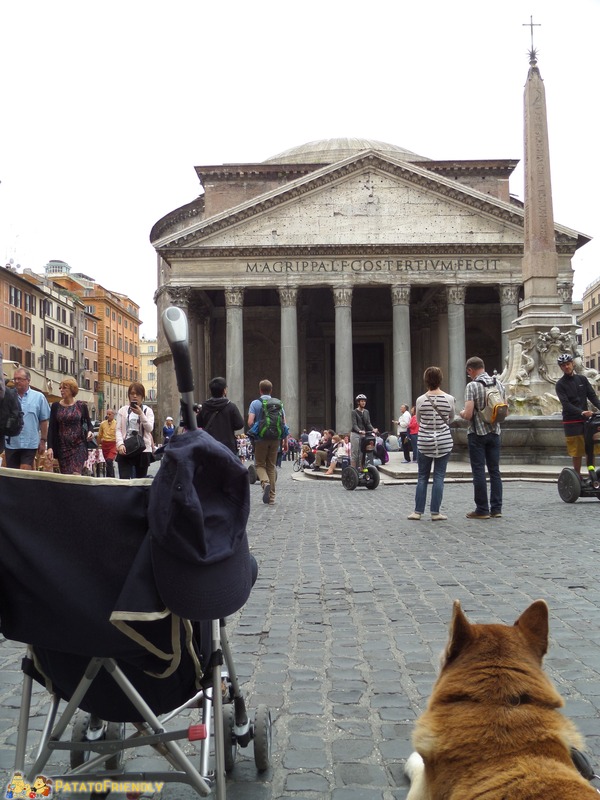 I’ve been in Rome many times before became a mother but some time ago we faced this big city for the first time with a child who still uses the stroller and a big dog. In fact we were traveling with our toddler – who turned two years in the capital – and a big dog of forty pounds. As I already told in the past, I usually prefer bring our furry friend with us only when we go in the midst of nature. But in this case the only solution was go all together and I can say that discovery Rome with our kid and our dog was a great experience. Rome is a city that fascinates everyone, including children, and also our dog was welcomed with open arms. I think that the inhabitants of Rome really like dogs! Amazingly, even if our dog is very big, everyone smiled at him, and even in the subway, which was crowded and confined spaces, the people caressed him without fear. So today I will share some helpful advice for anyone who wants to visit Rome with a small kid and a dog, trying to give useful information for both parents and masters! Before any useful advice about what to do in Rome with kids and dogs I make a premise: It seems incredible to say but our dog and our little boy often have needs very similar: both do not like too much confusion and need to play and stretch their legs (oops paws!) Every now and then, for both of you have to expect some stops for rest, shade and plenty of water. So here is some advice experienced! To move we used the subway and trains and of course we walked very much. In subway stations have always found working elevators, useful for both the stroller for our dog because – perhaps intimidated by the darkness and noise of the metro – did not want to separate from our toddler! The dog pays the ticket and must travel with a muzzle while children travel for free. Rome is full of fountains is useful to refresh the kids who drink to your four-legged, for we were very comfortable! The only precautions have to remember to bring a bowl (maybe a plastic plate!) To give your pet and make sure that – both puppies – not tuffino inside! 😉 For the children instead remember a glass if your kids still does not know to drink from the bottle! 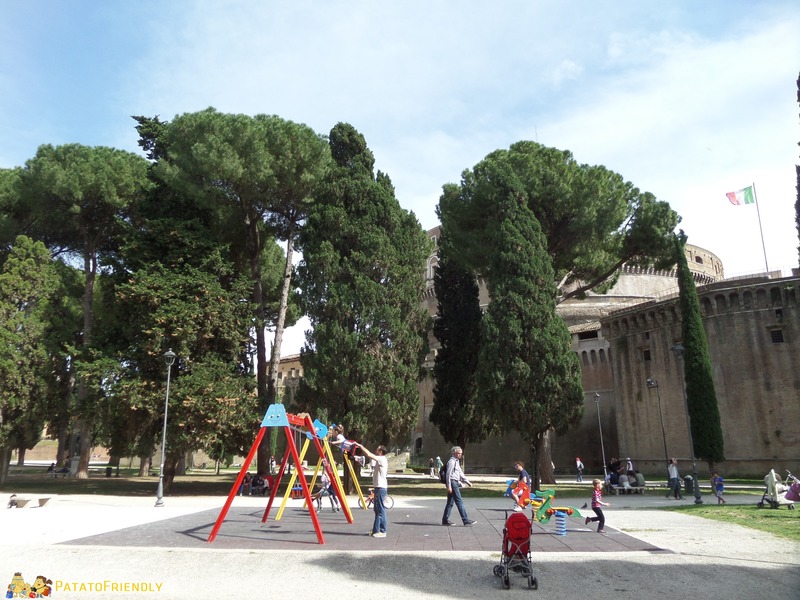 Castel Sant’Angelo: this park has free access to the dogs with a leash and you find a play area for children well cared for. 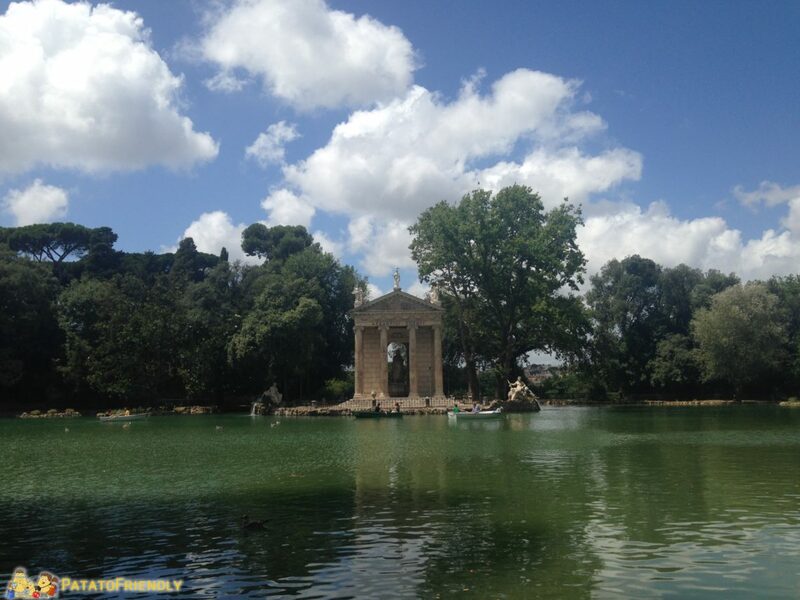 Villa Borghese: this big park is known by everyone, know that there is also an area dogs. To arrive to Rome we take the train called “Italo” on which dogs can travel in the appropriate places (wider than normal) paying a premium. To get on and off the muzzle then serves in the car is enough leash and they even provide a special absorbent pad where your dog lie down. Children instead travel for free in their parents’ lap and there’s the changing table. In general in Rome there are plenty of restaurants with a nice dehor, we traveling with baby and dog we preferred to dine with something on the fly and dine quietly at home. Two hundred degrees: just outside the Vatican, the sandwiches of this place are incredible. If we happen to now do not miss the snack sandwich nutella, mascarpone and pistachio. You can sit in the space or tables outside. 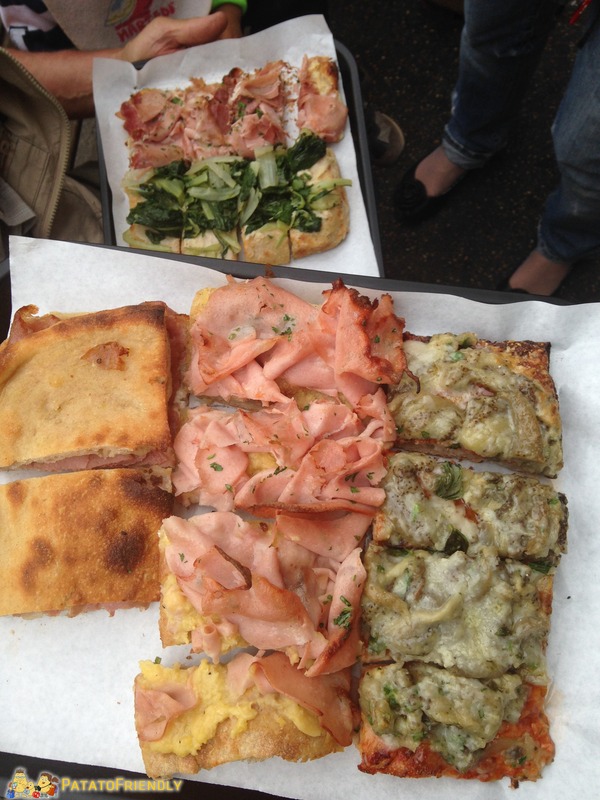 Pizzarium: always in the Vatican area, a bit ‘farther from the center, the pizza is simply divine. Try that with the eggplant parmigiana. There is no place to sit. Fonzie – The Burger’s House – Kosher: in the heart of the ghetto, a place where they make delicious kosher lamb burger. Try it! There are a few tables outside. During our holiday with kid and dog we stayed in this apartment called “Appartamento Regina” booked on site Only Apartments that accepted dogs also of great size. The location is very convenient public transportation (nearby there are the metro and train stations) and not far away there is a park with an area dedicated to the dogs. I can suggest you also an hotel where we stayed just two months after, when we came back to Rome without our dog: Hotel Pulitzer a business chic hotel “loaned” to the tourists with a strategic location for sightseeing and gargantuan breakfasts. It is located to the metro Marconi four stops from the Coliseum and comfortable as if we arrive with Italo train to Rome Ostiense. 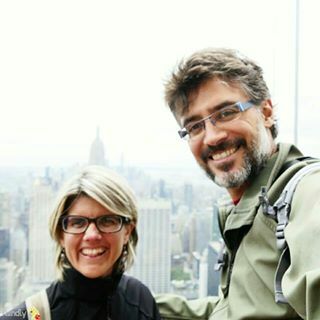 Travel couple and family passionate about discovering the world but in love with Italy too. We love to share our tips about Italy and we hope that you'll enjoy it!